Victory Medal. A circular, copper medal, lacquered bronze, 1.42 inches in diameter. This First World War medal was agreed to by all allies in March 1919. All medals were to be almost identical to obviate the need to exchange allied medals and each was patterned after a French medal of 1870. 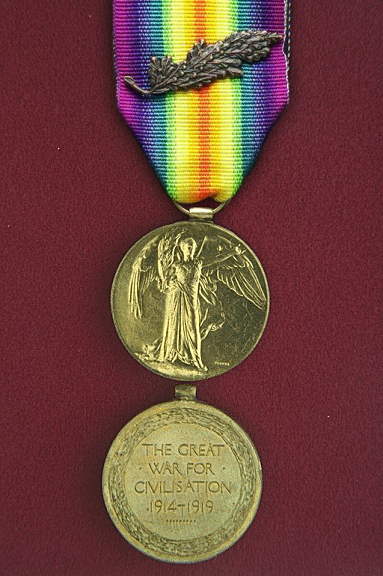 The medal was authorized in Britain (and for Canadians) on 01 September 1919. The medal was awarded to all ranks of the fighting forces, to civilians under contract, and others employed with military hospitals who actually served on the establishment of a unit in a theatre of war between 05 August 1914 and 11 November 1918 (inclusive). It was also awarded to members of the British Naval mission to Russia 1919 - 1920 and for mine clearance in the North Sea between 11 November 1918 and 30 November 1919. This medal was always issued with the British War Medal. A circular, copper medal, in lacquered bronze, with a size of 1.42 inches in diameter. For mounting purposes, there is a ring passing through a loop fixed to the top of the medal. The ring moves forwards and backwards but not sideways. The obverse shows the winged, full-length, full-front, figure of Victory, with her left arm extended and holding a palm branch in her right hand. The reverse shows the legend THE GREAT / WAR FOR / CIVILISATION / 1914 - 1919 in four lines, surrounded by a wreath, with dots below the words. The watered ribbon is 1.5 inches wide, and consists of nine coloured stripes: violet, blue, green, yellow, red yellow, green, blue, and violet. Only the Mentioned-in-Despatches multiple-leaved emblem is worn on this medal when it was awarded for WWI. There were no other bars. There were 351,289 medals awarded to the Canadian Expeditionary Force (CEF) and a total of 5,725,000 issued. The recipient's name, number and rank are engraved on the rim for the first issue.